Gold Shake-Out? Dollar Trendline Break? Gold saw a 1.5% drop today edging below $1,040 an ounce with the GLD following suit dropping $1.63. The drop brings GLD into a crucial support area at $102. GLD saw a sharp drop at the end of September as well dropping from over $99 into the $97 support level. 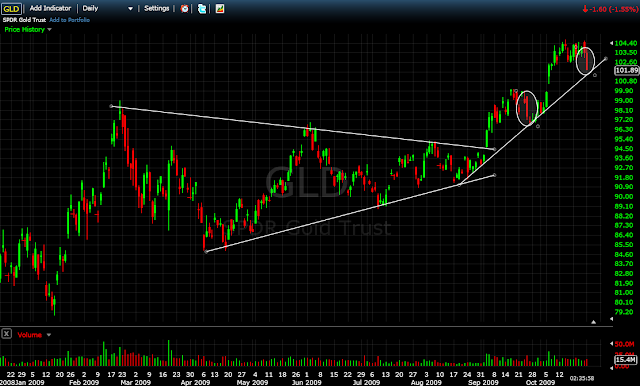 GLD held, quickly reversed off support and pushed to new highs. The pull-in acted as a shakeout of weak holders allowing gold to quickly rally without the overhead resistance from weaker sellers. Today saw a similar shakeout but the dynamics may have changed. GLD's ability to hold this area will let us know the velocity of this trade. If GLD can hold the rising trendline and slight congestion at $102 over the next couple days, the trade could ignite and experience significant momentum to the upside. A break of this area likely brings a retest of the $100 level and a better entry for the long-term. Either way I am long and waiting but measuring the strength along the way. Coupled with the gold fall today was a broad-based decline in commodity prices and a 104-point fall in the equity market. These declines were largely a result of a rallying dollar. 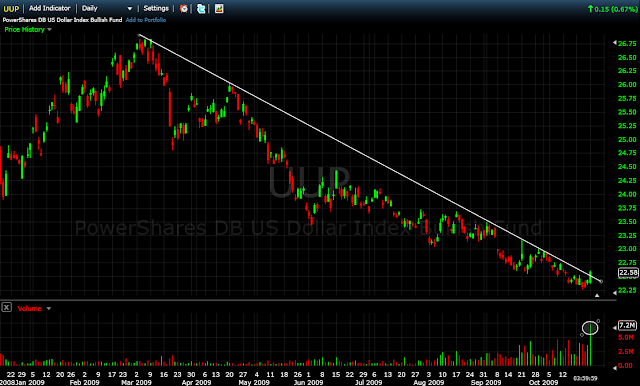 The dollar index saw a 0.77% jump today with UUP, the bullish dollar index ETF, seeing record volume. The dollar has been in a steep downtrend against other major currencies since the March 2009 peak. Today's action will cause the dollar shorts to pause. The large trading volume in the ETF points to the possibility of a change in the rate of change, as trendline breaks indicate. I do not expect a large counter-trend rally in the dollar but perhaps a stabilizing before the decline continues in the future. A bounce in the dollar will effectively be a rally in all assets priced in dollars from the perspective of non-US investors. The effective rise in prices will make US-denominated assets less attractive to the rest of the world. This will work to curtail the buying from what many have seen as crucial supporters of the current rallies, foreign buyers.